$3 million from Sorenson Legacy Foundation will add to Hinckley Scout Ranch. 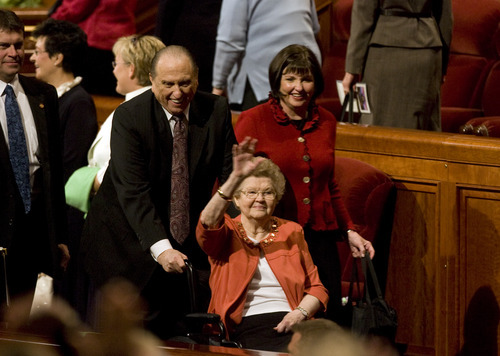 Kim Raff | The Salt Lake Tribune LDS President Thomas S. Monson and his wife, Frances Monson, leave the morning session of the 183rd General Conference of the LDS Church in 2012. Frances died in May 2013. A $3 million donation will allow the Great Salt Lake Council of the Boy Scouts to build a new lodge that it is naming in honor of LDS Church President Thomas S. Monson. The council says the 23,000-square-foot lodge will serve as the centerpiece of its Bryant S. Hinckley Scout Ranch, which contains a cluster of four Scout camps in the Uinta Mountains. The donation comes from the Sorenson Legacy Foundation, established by the James LeVoy Sorenson family for charitable endeavors. "The council has created exciting plans for the future of the Hinckley Scout Ranch, and we know this lodge will help them as they bring even more learning and service opportunities to the youth they serve," said Ann Crocker, president of the foundation. "This is more than just a lodge," said Rick Barnes, Scout executive for the council. "We have designed it as a multiuse facility that will be used for everything from trainings for adults, merit-badge classes, to weekend retreats, and will truly be the heart of the ranch." Barnes said construction could begin this spring. It is part of a large-scale remodel of the ranch, which includes additional training pavilions, restrooms, rifle and archery ranges, climbing walls, zip lines, an amphitheater and more. Monson has been a lifelong friend of the Boy Scouts. Since 1969, he has served as a member of the national executive board of the Boy Scouts of America. He has won its Silver Beaver and Silver Buffalo awards. Monson also has won the Bronze Wolf, international Scouting&apos;s highest award, and the Silver Fox Award from Scouts Canada.